Rhino Rack Transit Connect van rack is a great way to haul ladders and other cargo without filling up your cargo area. 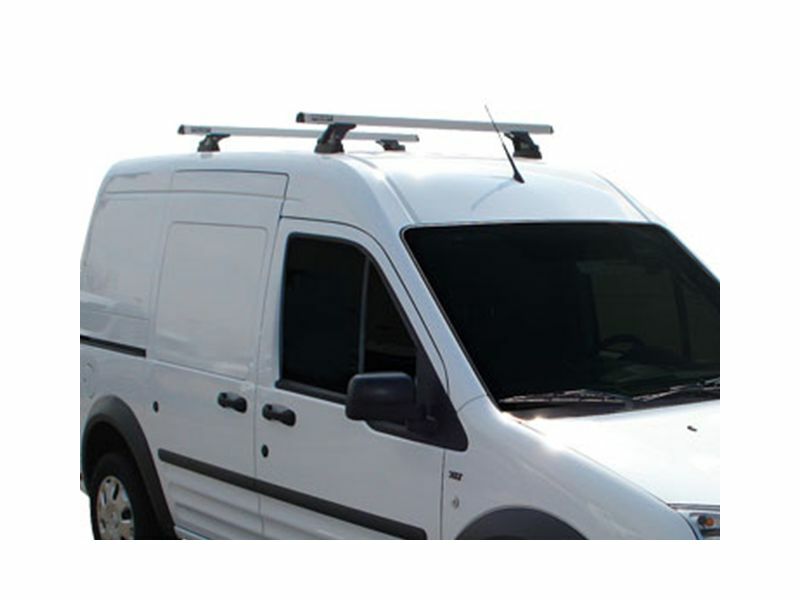 Adding a roof rack to your van is a great way to maximize the carrying capacity of the Transit Connect, helping you to get the job done better. The custom fitting foot pads ensure your rack will mount level and compliment the sleek lines of your Transit Connect van. This van rack kit utilizes Rhino Rack's heavy duty cross bars for more than enough strength, and can hold up to 220lbs. Available in either a two or three bar system, there's an option to fit anyone's needs. The Rhino Rack Transit Connect van rack is the ideal accessory for the working man's van. Get your kit today, and get your van to work. By purchasing your Rhino-Rack product you have agreed to be bound by the following Terms and Conditions. Any term, to the extent permitted by Law including all implied warranties and conditions are excluded except as provided in these Terms and Conditions and any term which could be alleged to be a condition or term of the contract and which does not form part of this warranty or is implied by legislation is expressly excluded and is to be disregarded. the purchase of your product. These Terms and Conditions provided by Rhino-Rack are known as ‘voluntary warranties’. This warranty extends to the original retail customer or recipient of the product (in the case of acquisition as a gift or promotion) and it is not transferable. As the original retail customer or recipient, you must return the completed warranty registration card if provided with the product or register the product online, within 21 days of the date of purchase of the product. This warranty is effective from the date of purchase of the product, if other conditions described in these Terms and Conditions are met. Original proof of purchase of the product or the receipt will be required for any warranty claim to be considered. a. Items that are capable of rust or other environmental degradation, including but not limited to powder-coated steel and zinc plated steel component products, carry a 3-year warranty calculated from the date of purchase of the product. b. Luggage boxes carry the warranty period as specified by the original manufacturer. c. Imported products that are stipulated by the exporter to carry a 3-year warranty will only carry a 3-year warranty. d. Any defect in materials or workmanship, which at the time of purchase of the product ought to have revealed to you by examination of the product. the purchaser, retailer or any other third party. f. This warranty only applies for manufacturing faults, and does not cover components, which by their nature may reasonably require periodic replacement due to normal wear, degradation or consumption. g. No warranty is given for defects or damage caused by modifications to the vehicle or the product or the users failure to properly secure cargo as recommended by Rhino-Rack. h. The warranty does not extend to consequential or incidental damage, including but not limited to damage to your vehicle, cargo or to any other person or property. i. It is your responsibility to maintain the product adequately, and any components subject to wear through use or exposure to the elements are inspected periodically and replaced with Rhino-Rack parts as required. j. No warranty is provided for failures caused by inadequate maintenance nor non-compliance to fitting instructions supplied by Rhino-Rack. Rhino-Rack recommends that our products be removed from your vehicle for regular cleaning and when not in use for extended periods. k. For Product(s)/component(s) with a 3-year warranty, the warranty period shall remain effective from the time of original retail purchase – the validity date shall not be altered by subsequent supply of any replacement product under the Terms and conditions of this warranty. a. Repairing or replacing (at Rhino-Rack’s option) the defective component (s) without charge for parts or labor to the original purchaser. Rhino Rack Transit Connect van rack can be easily installed right at home. Drilling is required when placing the rack foot pads. Clear instructions will be included with your purchase, and are also available on our site. If you have any questions or concerns, please don't hesitate to give us a call at 1-877-216-5446 or 701-253-5906.